Cofrad Mannequins is a world-renowned creator of artistic mannequins. 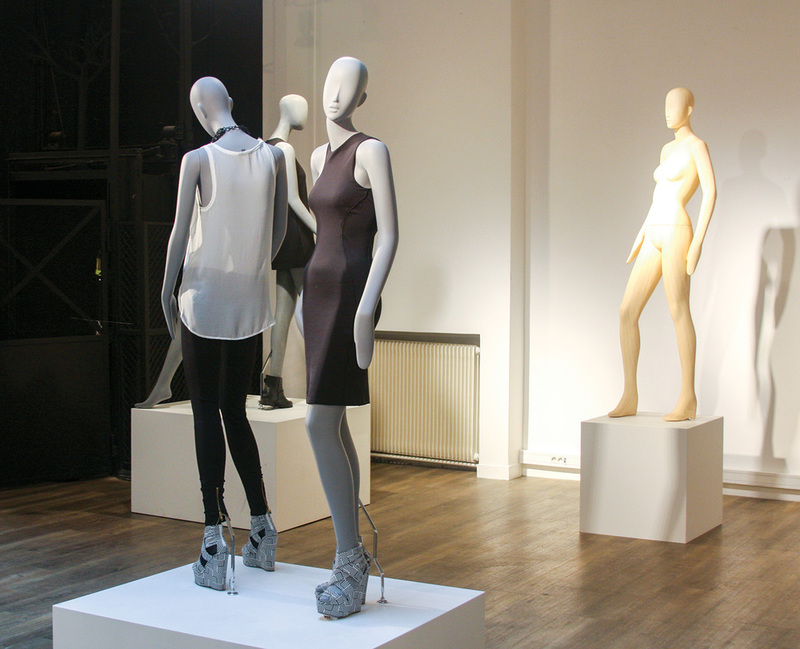 Every year Cofrad launches two new mannequin collections to the public. In collaboration with the Cofrad Art Director we updated their Paris showroom with the goal in mind of showcasing innovative materials, fresh finishes and countless colors. Four eclectic themes were created across a 2,400 square foot historical showroom. Each theme offered a story where each mannequin has a unique identity. The ultimate objective was to make an unforgettable experience where both the Cofrad sales team and clients felt inspired. 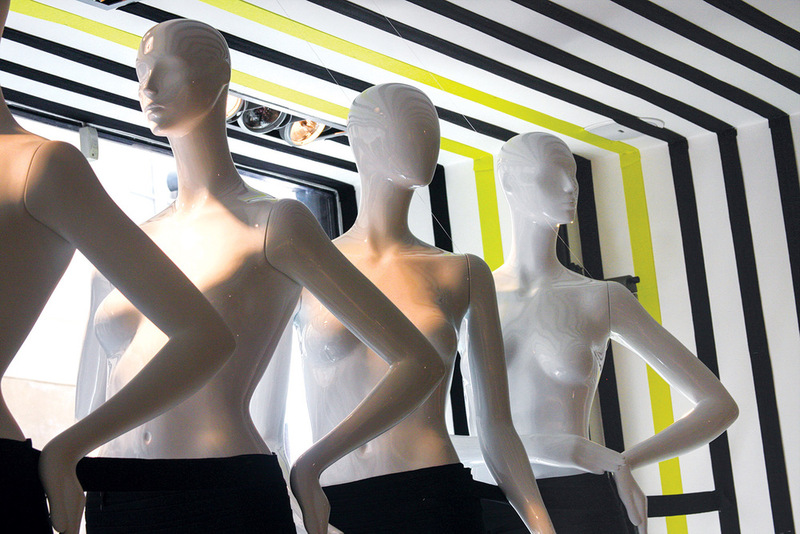 Inspired by the linear work of the artists Bridget Riley and Daniel Buren we created several installations that pulsated with rhythmic stripes that brought direct attention to the mannequins. Always using the same black and yellow nylon ribbons we achieved different artistic interpretations in a unified way. In the windows the ribbons were installed in mathematical precision creating a hypnotically visual effect. 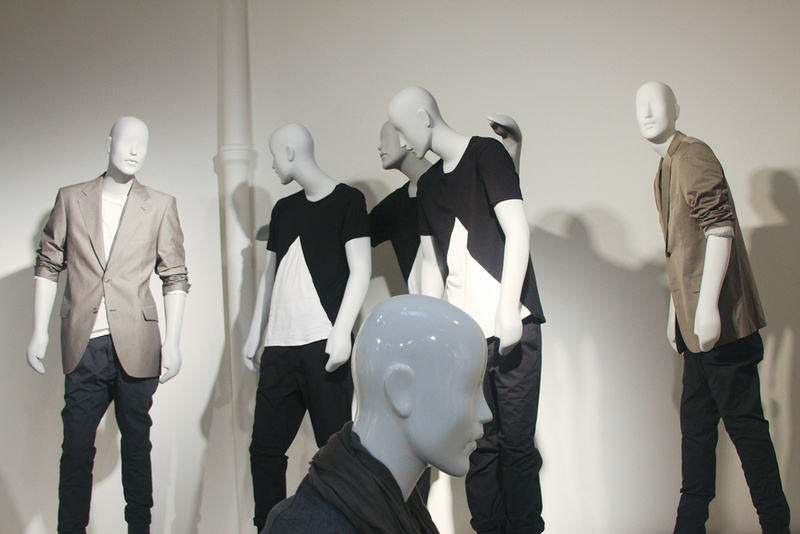 Five different mannequins belonging to the same collection were positioned in one strict military line and all looking in different directions protesting conformity. The suspended installation uses stripes in a more dynamic and angular way expressing the playfulness of motion in sports. For this theme we showcased relaxed silhouettes with muted, natural color palettes using male and female couples engaging with each other. The bust collection focused on featuring the beautiful finishes and traditional wooden arms that this vintage line offered. Having the busts in their natural state allowed the customer to touch and feel the product in a more personal way. To mark a change from the previous theme we created groups of young urban mannequins interacting with each other shifting the emphasis onto the idea social gatherings. The displays evoked different social groups and were meant to capture intimate moments between the personas. For this collection we concentrated on showing details in the female body through refined poses. Working exclusively with the idea of using contrasting colors to bring out the details the lingerie acted as an accent to celebrate the women’s body. We also introduced two mannequins with the iconic Yves Klein Blue color finish.